Rivers State Executive Council has directed the Attorney General of the State to prosecute the 2015 All Progressives Congress ( APC) Deputy Governorship Candidate , Honourable Asita Okorie for the murder of an NYSC member at Akinima in Ahoada West Local Government Area during the March 19, 2016 rerun legislative elections . Addressing journalists after the Rivers State Executive Council meeting presided over by Governor Nyesom Ezenwo Wike on Wednesday at the Executive Council Chambers of the Government House , Port Harcourt , Commissioner of Information , Dr Austin Tam-George informed that the council gave the directive in line with the recommendation of the Justice Monima Danagogo Commission of Inquiry into the violence and killings that characterised the March 19, 2016 rerun elections in the State . The Rivers State Executive Council also accepted the recommendation of the Commission of Inquiry which indicted the Nigerian Army as being associated with various acts of violence ranging from assault through malicious destruction of property to murder . 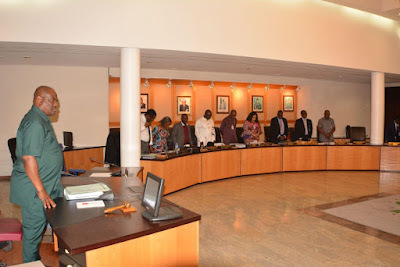 The Rivers State Executive Council which met on Wednesday also directed the State Attorney General to prosecute one Mr ThankGod Ode for an attempted murder in Ogonokom, Abua Odual Local Government Area . The Council also directed the Attorney General of the state to prosecute Mr Barry Mpigi for the murder of a pregnant woman whose name was Mrs Baby Nzuuga in Kpite Tai. He added that the Justice Monima Danagogo Commission of Inquiry indicted several politicians and state institutions over their roles in the destruction of lives and property during the March 19 rerun elections . The Rivers State Executive Council , therefore , directed the State Attorney General to file cases bordering on the enforcement of fundamental human rights for victims of the acts of violence by the Nigerian Army . These cases are to be filed pro-bono. The State Executive Council of the State accepted the recommendation of the Commission of Inquiry that the Nigerian Army’s participation in the rerun elections was illegal. It further accepted the recommendation that in line with several court judgments , the Nigerian military should not participate in elections . It will be recalled that Governor Wike set up the Commission of Inquiry on the 16th of April , 2016. The commission submitted its report to the Rivers State Government on 14th June , 2016.